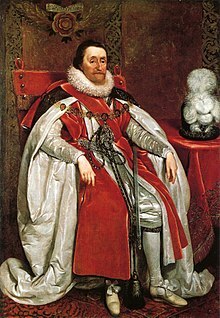 King of England, Scotland and Ireland; ruled in Scotland as James VI from 24 July 1567 until his death and, from the "Union of the Crowns", in England and Ireland as James I from 24 March 1603 until his death. James also commissioned a new translation of the Bible into English in 1604, though he took no direct part in the work which was done by 54 scholars under the oversight of Archbishop Richard Bancroft. The new translation, completed in 1611, came to be known as the King James version or Authorized Version and is often represented as KJV. "James VI and I," in Dictionary of National Biography, London: Smith, Elder, & Co., (1885–1900) in 63 vols.